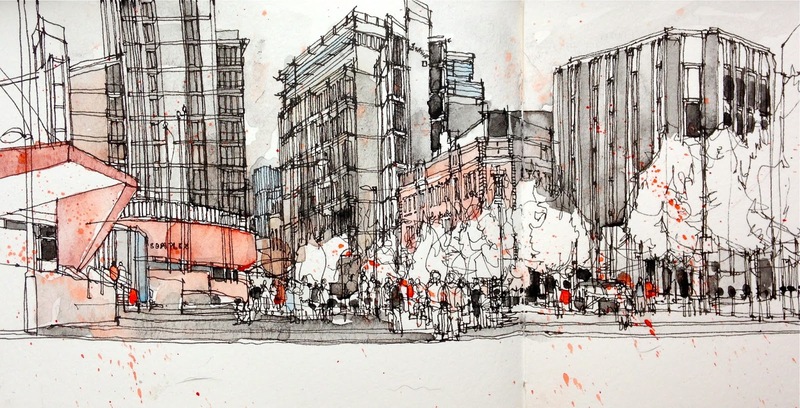 I'm having a few technical issues posting on the main Urban Sketchers homepage (which I'm hoping will soon be resolved) but thought in the meantime I would post here, as my recent work has definitely been inspired by Barcelona. 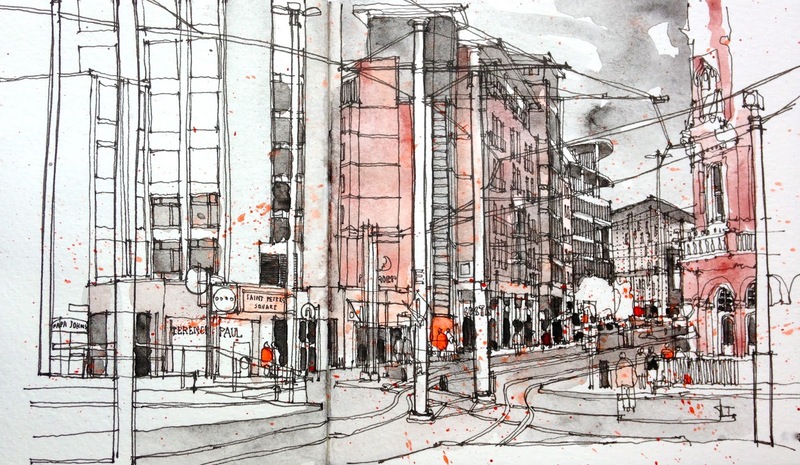 I had a drawing expedition Thursday afternoon into Manchester city centre. Firstly a quick warm up sketch and then a couple of more ambitious cityscapes. Anyone who did James Richard's excellent workshop at bcn will probably recognise I'm channeling Placa Catalunya with the G-Mex drawing...I drew the foreground first then added the buildings behind. The square was crowded with Manchester City fans as G-Mex was hosting a pre-season launch event. Very gloomy dark Manchester skies and a lot of rather sombre Victorian buildings in brick and sandstone meant I found myself using a very limited colour palette throughout, what turned out to be, a very productive afternoon of sketching. Here's a sketch from another miserable afternoon (weather-wise! ), sketching with the Manchester group at the Whitworth Art Gallery. At the end of the session there was just time for a quick sketch and seemed a great opportunity to use non waterproof ink...thanks again to Norberto Dorrantes for a fabulous workshop! Such a brilliant time in Barcelona, and I'm aware I only scratched the surface, so many people to meet, so much to inspire....so many new sketching friends. Until next time I wish you all well. Realmente buenos, me encantan. Como tratas la linea y la contención del color.